The household meat grinder is in electric mode and uses household 220V power supply. More and more families are using this product, making the household meat grinder the new favorite of kitchen appliances. 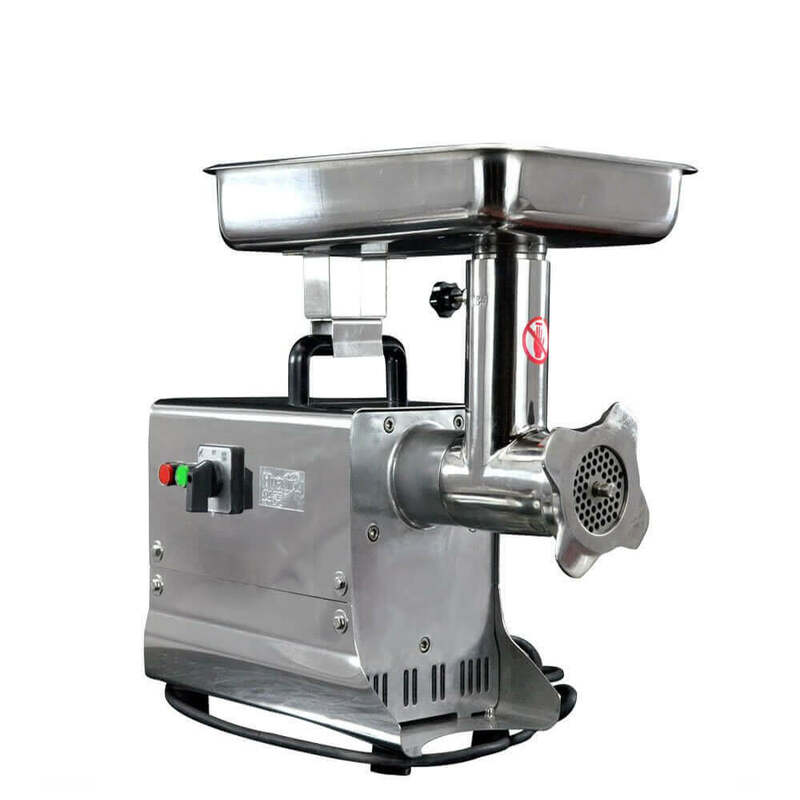 The reason why the domestic meat grinder is popular is that it can not only be used to break up meat but also can be used to chop peanuts, onions, garlic, spices, and other foods so that the household meat grinder becomes a food cooking machine. So it has also become a food cooking machine. The household meat grinder is in electric mode and uses household 220V power supply. More and more families are using this product, making the household meat grinder the new favorite of kitchen appliances. The reason why the domestic meat grinder is popular is that it can not only be used to break up meat but also can be used to chop peanuts, onions, garlic, spices, and other foods so that the household meat grinder becomes a food cooking machine. So it has also become a food cooking machine. The household meat grinder uses a motor with a relatively strong turning force, so it will heat up quickly during use. It is recommended that the continuous use time should not exceed 1 minute to extend the service life of the household meat grinder. 8. The internal motor has over-temperature protection function, longer service life, black small button safety switch device, also designed for safety. 9, set up with a boot security lock, the above mask does not card the machine does not turn, to ensure the user’s operation safety. The purpose of the household meat grinder is to use ground meat and vegetables. The knife edge is very sharp, so please use the intermediate shaft to clean the blade to avoid hurting your hand. Please avoid hard objects such as gelatin when grinding, so as not to damage the knife edge. There is a temperature control protection switch on the motor. When the motor continuously works overheating, it will automatically disconnect to protect the motor from being burned out. After the temperature drops, it will automatically recover, so that the life of the whole machine is guaranteed. The purpose of the household meat grinder is to stir the meat: 250g meat can be stirred at a time, and the work can be completed in about 30 seconds. You can also put the vegetables in the meat while stirring. The product can also stir vegetables and fruits separately. Another product can be used to pulverize granular objects, such as peanuts, or to stir liquid foods up to a maximum capacity of 1 liter. Through different food processing, you can make burgers, dumplings, buns, various meatballs, various salads and juices, users can use according to their own ideas. The household meat grinder adopts the method of grinding minced meat, just cut the meat into thick strips, put it into the machine and press the button to grind out the uniform primary color minced meat, without having to lick the arm on the cutting board, so that the arm is sour, save time Also save effort. Help you make sausages with special features quickly and easily. Beautiful shape, smooth curve, and easy cleaning. The kitchen is a good helper and has a lot of life. When using the meat grinder for household use, it is recommended to pause every 20 seconds. If you want the machine to be durable and play its function, when the motor has abnormalities such as heat and odor, be sure to stop it and cool it. Use it, otherwise, it will shorten its service life or cause motor burnout. Do not use for more than 1 minute. Before adding the better meat, add a little water to mix it, then add chopped green onion, ginger, pepper noodles or allspice, flavor, salt, a small amount of soy sauce, cooking wine, etc. If you are not too tired, you can add some vegetable oil. But if the meat is fat enough, you can save it, then mix it evenly in one direction, then adjust the saltiness. If you like, you can add sesame oil and see your taste. The minced meat can be dumped for a while. You can also use this method to make beef stuffing and mutton filling. The following is how to make some meat. Ingredients: 750 grams of chicken breast, 100 grams of net winter bamboo shoots, 50 grams of green onion, sesame oil, ginger, salt, monosodium glutamate, broth. Practice: Wash the chicken chopped meat into fine mud, cut the winter bamboo shoots into the fine sauce and fry in the oil pan for a while. Put the chicken puree in a pot, add onion, ginger, cooking wine, broth, salt, monosodium glutamate, stir well, add the winter bamboo shoots, and stir a few times. Ingredients: 700 grams of peeled fish, 50 grams of fat meat, 200 grams of glutinous rice, 50 grams of green onion, cooking wine, ginger, salt, monosodium glutamate, broth. Practice: float the fish in clear water, remove the rough thorn, and use a meat grinder to twist into a fine mud. The fat meat is twisted into coarse pieces, and the yellow meat is chopped. Take a deep pot, add the fish puree soup, open, add wine, onion, ginger, MSG, salt, whipped with hand clockwise, and finally add fat meat, simmering yellow. Ingredients: 250 grams of parsley, 150 grams of pork stuffing. Raw soy, cooking wine, salt, monosodium glutamate, sesame oil, the right amount. Practice: Wash the parsley clean, drain the mud and smash it into pieces, mix in a little sesame oil for use. Put the twisted meat into the pot, add all the seasoning, and mix well. Finally, add the coriander and stir well. 1. After the coriander is good, if the moisture is very much, you can use gauze to squeeze out the vegetable juice, and the vegetable juice can be left as a filling. 2, pork stuffing should be fat and moderate, preferably the proportion of fat three thin seven, cooked dumplings will be fragrant. The vegetables are chopped and mixed with the minced meat. Carrot Pork Stuffing: Carrot shaved filaments, mixed with minced meat. Mushroom meat stuffing: fresh shiitake mushrooms are minced and mixed with twisted preparation. This entry was posted in Encyclopedia. Bookmark the permalink.